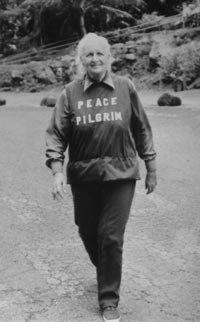 Peace Pilgrim was a famous Activist from USA, who lived between July 18, 1908 and July 7, 1981. She became 72 years old. Peace Pilgrim (born as Mildred Lisette Norman) was an American peace activist. She went 28 years by the United States and traveled here more than 40,000 kilometers to her ideas about preaching peace. She called herself Peace Pilgrim and this is no longer used her own name. She is born under the zodiac cancer, who is known for Emotion, Diplomatic, Intensity, Impulsive, Selective. Our collection contains 32 quotes who is written / told by Peace, under the main topics: Diet, Power. "If you realized how powerful your thoughts are, you would never think a negative thought"
"When you find peace within yourself, you become the kind of person who can live at peace with others"
"The way of peace is the way of love. Love is the greatest power on earth. It conquers all things"
"No one can find inner peace except by working, not in a self- centered way, but for the whole human family"
"As I lived up to the highest light I had, higher and higher light came to me"
"People see themselves as the center of the universe and judge everything as it relates to them"
"My appointed work is to awaken the divine nature that is within"
"I don't eat junk foods and I don't think junk thoughts"
"You're in a much better position to talk with people when they approach you than when you approach them"
"We are all cells in the same body of humanity"
"There is a criterion by which you can judge whether the thoughts you are thinking and the things you are doing are right for you. The criterion is: Have they brought you inner peace?" "Praying without ceasing is not ritualized, nor are there even words. It is a constant state of awareness of oneness with God"
"Do not suppress it - that would hurt you inside. Do not express it - this would not only hurt you inside, it would cause ripples in your surroundings. What you do is transform it"
"Anything you cannot relinquish when it has outlived its usefulness possesses you, and in this materialistic age a great many of us are possessed by our possessions"
"You are within God. God is within you"
"Worry is a useless mulling over of things we cannot change"
"To attain inner peace you must actually give your life, not just your possessions. When you at last give your life - bringing into alignment your beliefs and the way you live then, and only then, can you begin to find inner peace"
"For light I go directly to the Source of light, not to any of the reflections"
"Unnecessary possessions are unnecessary burdens. If you have them, you have to take care of them! There is great freedom in simplicity of living. It is those who have enough but not too much who are the happiest"
"There is something to that old saying that hate injures the hater, not the hated"
"The valid research for the future is on the inner side, on the spiritual side"
"One little person, giving all of her time to peace, makes news. Many people, giving some of their time, can make history"
"This is the way of peace: Overcome evil with good, falsehood with truth, and hatred with love"
"The simplification of life is one of the steps to inner peace. A persistent simplification will create an inner and outer well-being that places harmony in one's life"
"Pure love is a willingness to give without a thought of receiving anything in return"
"Humanity has only scratched the surface of its real potential"
"A pilgrim is a wanderer with purpose"
"Make food a very incidental part of your life by filling your life so full of meaningful things that you'll hardly have time to think about food"
"Keep your feet on the ground and your thoughts at lofty heights"
"Before the tongue can speak, it must have lost the power to wound"